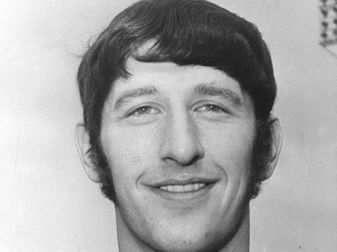 Jim first came to Chesterfield's attention when playing against the club for Albion Rovers in a pre-season friendly, arranged after we'd signed Sam Ferris from the Coatbridge side. Brighton were on the verge of signing him but he opted for us in December 1972 and soon became a favourite, doing much to strengthen the club's famed association with top-class 'keepers. Fans were proud to see Jim represent the Scottish under-23 side, against an England team that included former Spireite Alan Stevenson in their nets. That pride turned to outrage when the club, chasing promotion in '73-4, sold him to the Blades on transfer deadline day, a move that quite took Jim by surprise. Needless to say, he soon won the respect of all at Bramall Lane and went on to make his full international debut for Scotland in a European Championship qualifier: the Scots were unable to get the win over Romania that they needed for qualification and Jim was never called on again by his country, despite playing well on the night. Like many leading players of the time, Jim enjoyed an eye-opening spell in the United States, playing alongside and against many of the world's finest footballers.Upon his return to England he played out the end of the '82-3 season with Kettering, before returning to Saltergate as the club attempted to pick up the pieces after the 1983 financial crisis. His performances were not restricted to stopping goals: he scored from 97-yards to help his team beat Stockport County on October 8th, 1983. It was his second career goal, having found the net two years earlier when playing for the Washington Diplomats in a North American Soccer League game against Atlanta. After being first-choice in '83-4 Jim lost his place to the emerging Chris Marples but accepted this with good grace and kept up the pressure on the youngster: Jim was re-established as number one choice before Marples was sold to Stockport in '86-7. The following season Jim endured perhaps the most humiliating game of his long career as Gillingham crashed ten goals past him to record the Spireites' heaviest League defeat. Fans attached no blame to Jim for this, though: he was badly injured in trying to keep out the first goal and should really have been substituted at that point. It is entirely typical of Jim that he continued in such a resolute fashion as the goals piled up. As Jim's playing career drew to a close another equally important role emerged for the likeable Scot. His love of hard work made him entirely suitable for the position of Chesterfield's Commercial Manager. He has held the post since 1986 and, as such, he was instrumental in setting up the club's highly successful 'Blues on the Move' lottery that, on its own, has done much to assure the club's future. In his forty-first year his career took an unexpected twist when named as the team's substitute 'keeper on twelve occasions in '93-4. Jim was also named as Chesterfield's goalkeeping substitute at the 1995 Wembley play-off, and in the club's first round match in the 1997-8 FA Cup, at the age of 45 years and 188 days. Still, Jim had his most important Saltergate role to play, as one of those club staff members who bravely stood up to the convicted fraudster Darren Brown. Concerned that decent business practises were not being adhered to Jim and three other staff began kept records that were important in bringing Darren Brown to heel. Jim gave evidence against Brown to the League's investigation, despite Darren Brown still being at Saltergate - one can only guess how intimidating that must have been. The ledgers kept by Jim and the others - Joan Muir, Joanne Hadley and Aimee Miles - were later used in the criminal proceedings that put Darren Brown behind bars. Let no-one doubt that if Jim and his fellow employees had looked out for themselves and kept quiet, Darren Brown would have finished this club off, for there would have been no-one left to stop him. In our understandable haste to put the whole unappetising business behind us, not enough has been done to acknowledge this. (The lack of a testimonial, at least, is an gross oversight on the club's part.) Jim's bravery and devotion to the club were never in question while he wore the green, but he kept his greatest "save" - that of our football club - for the 2001-2 season.